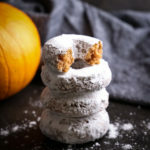 These Pumpkin Spice Baked Donuts are the perfect easy-to-make fall dessert for donut lovers, made with real pumpkin and dipped in powdered sugar! Preheat your oven to 350 degrees Fahrenheit and grease a donut pan with butter or vegetable oil spray (I use a medium-sized 12-donut pan). In a large mixing bowl, whisk together the flour, sugar, baking soda, salt, cinnamon, cloves, ginger and nutmeg. Add the pumpkin puree, beaten eggs, vegetable oil, and vanilla, and whisk the mixture together just until the flour disappears (scrape down the sides of the bowl with a rubber spatula to be sure everything is incorporated). Add the batter to a piping bag and pipe the donuts into the prepared pan. Be sure not to over-fill them - fill them only 1/2 way to ensure the donuts have the correct shape after baking. Bake for about 11-15 minutes at 350 degrees Fahrenheit or until the donuts lose their shine on top and bounce back when you touch them. Let the donuts cool in the pan for at least 15 minutes before removing them to a wire rack to cool completely. Once the donuts are completely cool, dip them in the powdered sugar pressing the powdered sugar onto the sides of the donuts to be sure they're well coated. Enjoy immediately for best results, or store in an airtight container for up to 2 days.